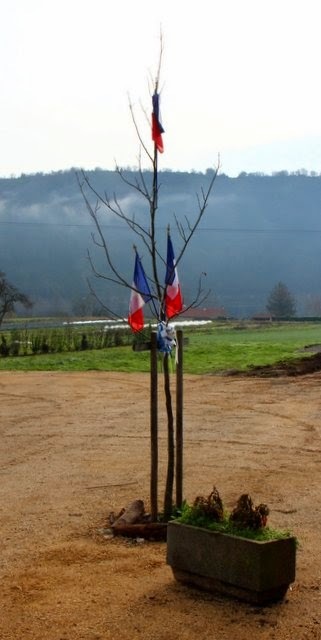 Tree planted at the Mairie last summer for the inaguration of the new mayor and village council. Last night was the annual village gathering to receive best wishes for the new year from the Mayor and the village council. Everyone comes to wish everyone else the same thing, 'Bonne annee et bonne sante' which literally translates to 'good year and good health.' I lost count of how many kisses I received and how many times I said these words to my friends and neighbors! Before the Mayor's address to the village, we observed a full minute of silence in honor of the victims of this week's violence in Paris. We live very far away from Paris' hustle and bustle and equally as far away from her lifestyle, but every French man, no matter where he lives, bleeds blue, white and red for France; every French woman holds Marianne dear to her heat. It was a very solemn moment. Jacques' speech was brief extending good wishes to all for a happy new year and then giving a quick overview of the work of each council committee. The highlight was, of course, the lovely update of the road and area around the Mairie. Of note....the village population has increased to a whopping 177 souls! We're growing! The evening closed with drinks and nibbles compliments of the Mayor and the council. Solidarity is important in French life. I felt it keenly last evening with my village. I love these simple village get togethers....& so much more significant after the events of last week in Paris. We felt it deeply here in the states too. I posted a few photos of shows of solidarity in Charleston. We also attended a French film on the Friday after with many Francophiles in attendance. We also began with a moment of silence & a moving tribute. So sad.